KOLWEZI, DEMOCRATIC REPUBLIC OF CONGO – Ivanhoe Mines (TSX: IVN; OTCQX: IVPAF) Executive Chairman Robert Friedland and Chief Executive Officer Lars-Eric Johansson today welcomed the positive findings of an expanded, independent preliminary economic assessment (PEA) for the development of the Kakula Discovery at the Kamoa-Kakula Project on the Central African Copperbelt, in the Democratic Republic of Congo (DRC). Given the dramatic expansion and upgrading of the copper resources delineated at Kamoa-Kakula during the past year, the new PEA incorporates potential increased mining rates that are 50% higher than the rates used in the December 2016 PEA. The Kamoa-Kakula Project - a joint venture between Ivanhoe Mines, Zijin Mining Group and the DRC government - has been independently ranked as the world's largest high-grade, major copper discovery by international mining consultant Wood Mackenzie. Initial mine development scenario. The Kakula 2017 PEA evaluates the development of a six million-tonne-per-annum (Mtpa) underground mine and surface processing complex at the Kakula Deposit - a discovery announced in early 2016 - as the project's first phase of development. Expanded, two-mine development scenario. The Kakula 2017 PEA also includes an option for an integrated, 12 Mtpa, two-stage development, beginning with initial production from the Kakula Mine, to be followed by a subsequent, separate underground mining operation at the nearby Kansoko Mine, along with the construction of a smelter. Kamoa 2017 pre-feasibility study (PFS). The Kamoa 2017 PFS evaluates the development of the Kansoko Mine as a stand-alone six Mtpa underground mine and surface processing complex that would be supplied with ore from the planned development of the Kansoko Sud and Kansoko Centrale areas of the Kamoa Deposit, which were discovered in 2008. The PFS refines the findings of the Kamoa March 2016 PFS, which envisaged a production rate of three Mtpa. The Kakula 2017 PEA and Kamoa 2017 PFS were independently prepared by OreWin Pty. Ltd., Amec Foster Wheeler E&C Services Inc., SRK Consulting Inc., Stantec Consulting LLC, Golder Associates Ltd., KGHM Cuprum R&D Centre Ltd. and DRA Global. The Kakula 2017 PEA is preliminary in nature and includes an economic analysis that is based, in part, on Inferred Mineral Resources. Inferred Mineral Resources are considered too speculative geologically for the application of economic considerations that would allow them to be categorized as Mineral Reserves - and there is no certainty that the results will be realized. Mineral Resources do not have demonstrated economic viability and are not Mineral Reserves. A NI 43-101 technical report will be filed on SEDAR at www.sedar.com and on the Ivanhoe Mines website at www.ivanhoemines.com within 45 days of the issuance of this news release. 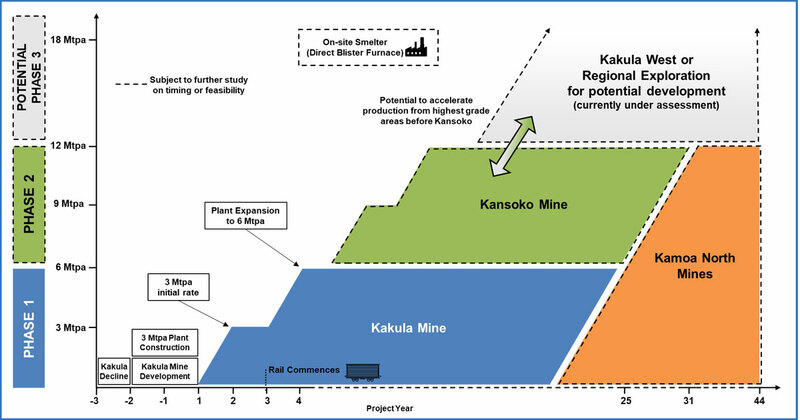 While not evaluated in the new PEA, Ivanhoe and Zijin also are exploring potential options to accelerate future production by building the Kakula and Kansoko mines concurrently as well as expansions to 18 Mtpa and beyond as exploration progresses at Kamoa-Kakula and on Ivanhoe's 100%-owned exploration licences in the Western Forelands area to the west of Kamoa-Kakula, where drilling recently started. "Kamoa-Kakula is, without a shadow of a doubt, the most disruptive Tier One copper project in the world today," said Mr. Friedland. "The 12 million-tonne-per-annum development scenario clearly shows the economic potential for a phased development plan for Kamoa-Kakula to become one of the largest copper mines in existence. However, we are confident that there are more high-grade copper discoveries to be made in the area and the ultimate scale of operations at Kamoa-Kakula will be much larger. "The exceptionally high copper grades, thickness and continuity of the Kakula Discovery really distinguish this project from anything we have seen during our 35-plus years in the industry. These unique characteristics should allow us to build a world-scale copper mine with an initial capital cost expected to be far lower than other operations of this size." Mr. Friedland noted that today's PEA announcement does not factor in the Kakula West Discovery, which is continuing to be expanded at a remarkable rate. The current study also does not factor in the ongoing drilling programs on new targets at Kamoa-Kakula or the company's 100%-owned Western Forelands exploration area. Additional exploration success could have a significant influence on the size, value and timing of the overall development plan; as such, the Kamoa-Kakula development plans will be reassessed and amended as the project moves forward to reflect ongoing exploration results. "We remain focused on unlocking the full potential of the Kamoa-Kakula copper district while expediting the development of the initial Kakula Mine. "The world's current top copper mines are aging and their head grades are declining. Given the projected surge in demand for copper from the electric-vehicle revolution and renewable energy technologies, Kamoa-Kakula will be of significant strategic importance for auto makers and clean-energy companies looking to secure a long-term, reliable supply of high-quality copper," Mr. Friedland added. Mr. Johansson said that implementation of community-support initiatives are central to mine-planning considerations. "We will be working with our partners Zijin Mining and the DRC government in developing Kamoa-Kakula into the world's next great copper mine, generating widely shared economic benefits that will help to uplift local communities, and providing skills training to help ensure that area residents can qualify for the thousands of meaningful direct and indirect jobs that will be created. "It is highly unusual by industry standards that, despite being in the early exploration and engineering phases of a project, Ivanhoe and Zijin are proud to be leading by example and have invested heavily in community development initiatives. Our joint efforts include the "KNOW FOR SURE" anti-malaria campaign utilizing revolutionary technology developed by Fio Corporation of Toronto, Canada. Other initiatives include fish and chicken farming, agricultural projects, and the construction of schools, roads and power infrastructure. "Everyone at Ivanhoe Mines looks forward to showcasing our three mine development projects - Kamoa-Kakula, Kipushi and Platreef - to investors from around the world as the official site visit of the 2018 Mining Indaba conference that will be held in Cape Town, South Africa, in early February 2018. Those interested in attending our site visit should apply to our investor relations department as soon as possible." The PEA analyzes the potential development of an initial six Mtpa Kakula Mine at the Kakula Deposit in the southerly portion of the Kamoa-Kakula Project's discovery area. For this option, the PEA envisages an average annual production rate of 246,000 tonnes of copper at a mine site cash cost of US$0.45/lb copper and total cash cost of US$1.08/lb copper for the first five years of operations, and copper annual production of up to 385,000 tonnes by year four. An initial capital cost of US$1.2 billion for this option would result in an after-tax net present value at an 8% discount rate (NPV8%) of US$4.2 billion. The internal rate of return of 36.2% and project payback period of 3.1 years confirm the compelling economics for Kamoa-Kakula's initial phase of production. 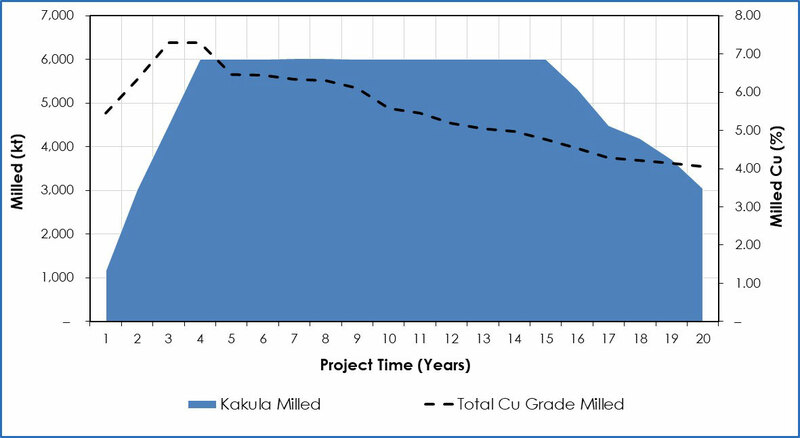 Kakula benefits from an ultra-high, average feed grade of 6.4% copper over the first 10 years of operations, and 5.5% copper on average over a 24-year mine life. A six Mtpa Kakula PFS is underway, with completion targeted for the second half of 2018. Kakula's surface box cut was completed on October 26 this year. Development of twin underground declines, similar to those at the nearby Kansoko Mine, has begun and is expected to take about a year to complete. The first blast for the declines was completed on November 16. The PEA also presents the development of a two-phase, sequential operation on Kamoa-Kakula's high-grade copper deposits. Initial production would occur at a rate of six Mtpa from the Kakula Mine, before increasing to 12 Mtpa with ore from the Kansoko Mine. As resources at Kakula and Kansoko are mined, the PEA envisages that production would begin at Kamoa North to maintain 12 Mtpa throughput over a 44-year mine life. For the two-phase sequential operation, the PEA envisages US$1.2 billion in initial capital costs. Future expansion at the Kansoko Mine and subsequent extensions could be funded by cash flows from the Kakula Mine, resulting in an after-tax net present value at an 8% discount rate (NPV8%) of US$7.2 billion and an internal rate of return of 33%. Under this approach, the PEA also includes the construction of a direct-to-blister flash copper smelter with a capacity of 690,000 tonnes of copper concentrate per annum to be funded from internal cash flows. This would be completed in year five of operations, achieving significant savings in treatment charges and transportation costs. The 12 Mtpa scenario delivers average annual production of 370,000 tonnes of copper at a total cash cost of US$1.02/lb copper during the first 10 years of operations and production of 542,000 tonnes by year nine. At this future production rate, Kamoa-Kakula would rank among the world's five largest copper mines. In addition to the Kakula PEA, a PFS also has been completed for the development of a six Mtpa Kansoko Mine at the Kamoa Deposit, the project's original discovery area. For this option, the PFS envisages an average annual production rate of 178,000 tonnes of copper for the first 10 years of operations, and annual copper production of 245,000 tonnes by year seven. The initial capital cost of US$1.0 billion to develop this mine would result in an after-tax NPV8% of US$2.1 billion - an increase of 109% compared to the after-tax NPV8% of US$986 million that was projected in the March 2016 Kamoa PFS. The internal rate of return is 24%, with a project payback period of five years. Ivanhoe is continuing to explore options to increase Kamoa-Kakula production to 18 Mtpa and beyond. In light of the successful step-out drilling at Kakula West, as well as the potential to find additional resources in high-priority targets located in the untested parts of the Kamoa-Kakula Project, development plans will be reassessed and amended as the project moves forward. 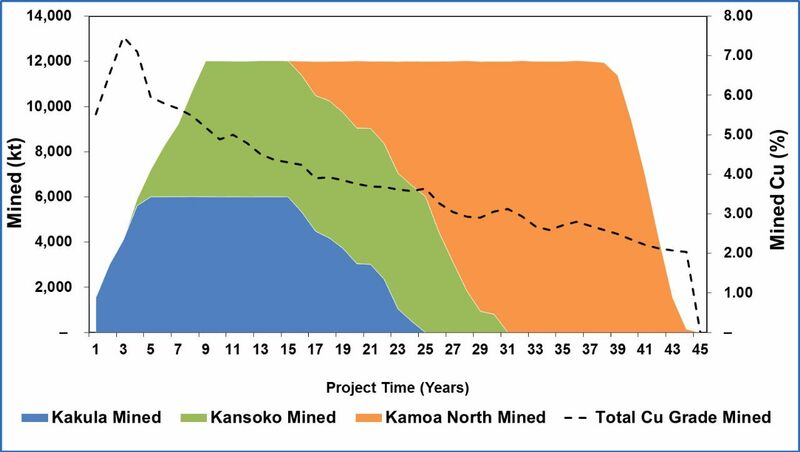 Figure 1 describes the potential development scenarios and Figure 2 shows an overview of deposits included within Kakula 2017 PEA (six Mtpa and 12 Mtpa case) and Kamoa 2017 PFS (six Mtpa). Figure 1. Kamoa-Kakula PEA long-term development plan. Figure 2. 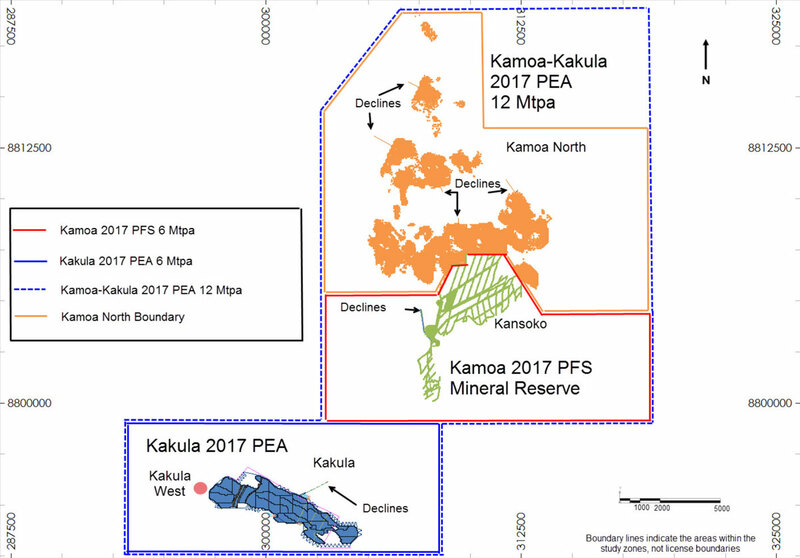 Overview of deposits included within Kakula 2017 PEA (six Mtpa and 12 Mtpa case) and Kamoa 2017 PFS (six Mtpa). Very-high-grade initial phase of production is projected to have a grade of 7.3% copper in year four and an average grade of 6.4% copper over the initial 10 years of operations, resulting in estimated average annual copper production of 284,000 tonnes. Annual copper production is estimated at 385,000 tonnes in year four. Initial capital cost, including contingency, is estimated at US$1.2 billion. Average total cash cost of US$1.14/lb of copper during the first 10 years. After-tax NPV, at an 8% discount rate, of US$4.2 billion. After-tax internal rate of return (IRR) of 36.2%, and a payback period of 3.1 years. Kakula is expected to produce a very-high-grade copper concentrate in excess of 50% copper, with extremely low arsenic levels. The study assesses the potential development of the Kakula Deposit as a six Mtpa mining and processing complex. The Kakula mill would be constructed in two smaller phases of three Mtpa each as the mining operations ramp-up to full production of six Mtpa. The life-of-mine production scenario provides for 108.4 million tonnes to be mined at an average grade of 5.48% copper, producing 9.4 million tonnes of high-grade copper concentrate, containing approximately 11.4 billion pounds of copper. The economic analysis uses a long-term price assumption of US$3.00/lb of copper and returns an after-tax NPV at an 8% discount rate of US$4.2 billion. It has an after-tax IRR of 36.2% and a payback period of 3.1 years. The estimated initial capital cost, including contingency, is US$1.2 billion. The capital expenditure for off-site power, which is included in the initial capital cost, includes a US$71 million advance payment to the DRC state-owned electricity company, SNEL, to upgrade two hydropower plants (Koni and Mwadingusha) to provide the Kamoa-Kakula Project with access to clean electricity for its planned operations. Mwadingusha is being upgraded first. The work is being led by Stucky Ltd., of Switzerland; the advance payment will be recovered through a reduction in the power tariff. Key results of the Kakula 2017 PEA for a single six Mtpa mine are summarized in Table 1. Table 1. 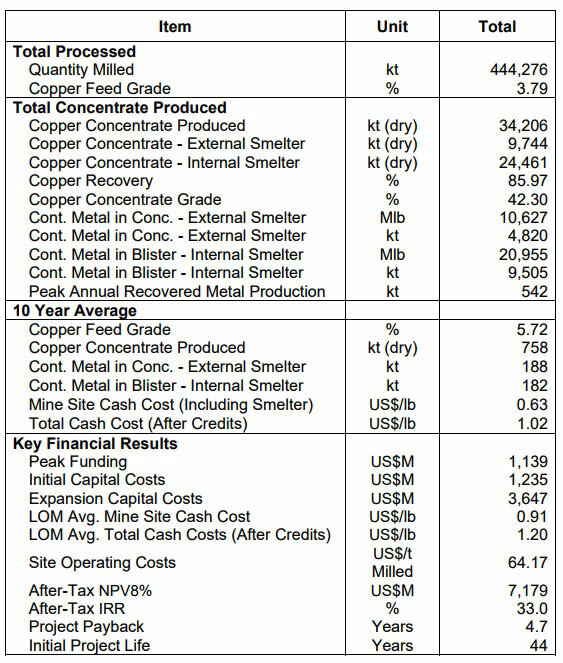 Kakula Mine results summary for six Mtpa production. Table 2. Kakula Mine financial results for six Mtpa production. Table 3. Kakula Mine average estimated production and processing statistics for six Mtpa production. The Kakula concentrator production is shown in Figure 3 and the concentrate and metal production is shown in Figure 4. Figure 3. Kakula Mine estimated tonnes milled and head grade for the first 20 years. Figure 4. Kakula Mine estimated concentrate and metal production for the first 20 years. Table 4. Kakula Mine unit operating costs for six Mtpa production. Figure 5. 2018 Mine-site cash costs (includes all operational costs at mine site). Note: Represents mine-site cash costs that reflect the direct cash costs of producing paid concentrate or cathode incorporating mining, processing and mine-site G&A costs. Kakula is based on the average mine-site cash cost during the first 10 years as detailed in the Kakula 2017 PEA. Source: Wood Mackenzie (based on public disclosure, the Kakula 2017 PEA has not been reviewed by Wood Mackenzie). Figure 6. 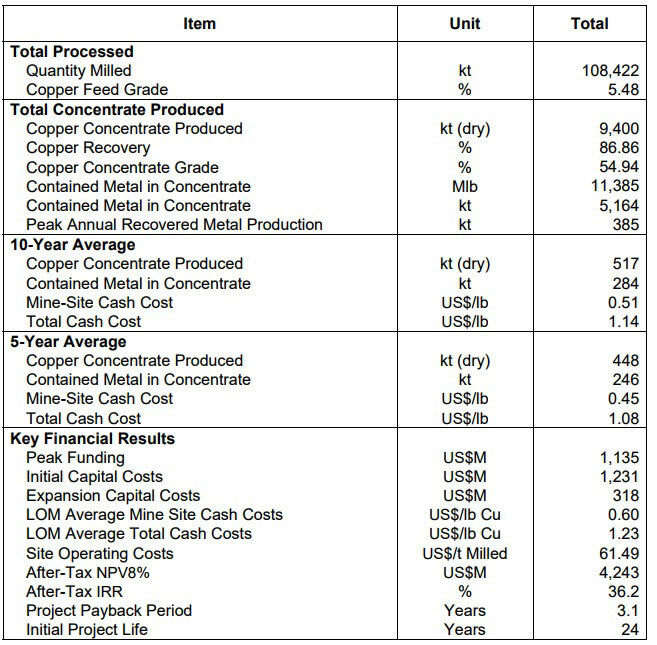 2018 C1 pro-rata copper cash costs (includes mining, processing, transportation and offsite realization costs). Note: Represents C1 pro-rata cash costs that reflect the direct cash costs of producing paid metal incorporating mining, processing, mine-site G&A and offsite realization costs, having made appropriate allowance for the costs associated with the co-product revenue streams. Kakula is based on the average total cash cost during the first 10 years as detailed in the Kakula 2017 PEA. Source: Wood Mackenzie (based on public disclosure, the Kakula 2017 PEA has not been reviewed by Wood Mackenzie). 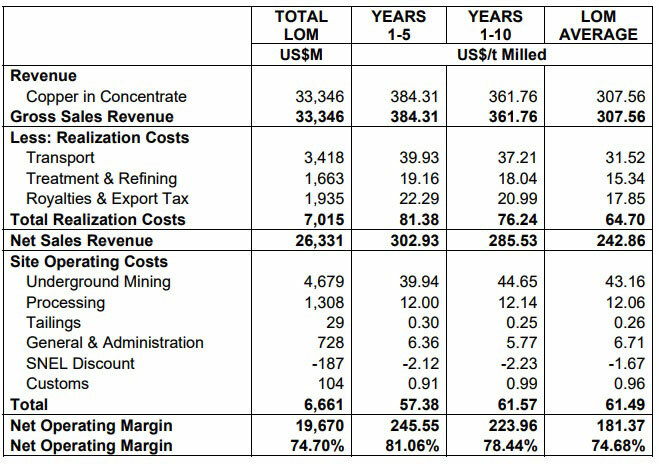 Table 5 Kakula Mine estimated revenue and operating costs for six Mtpa production. Table 6. 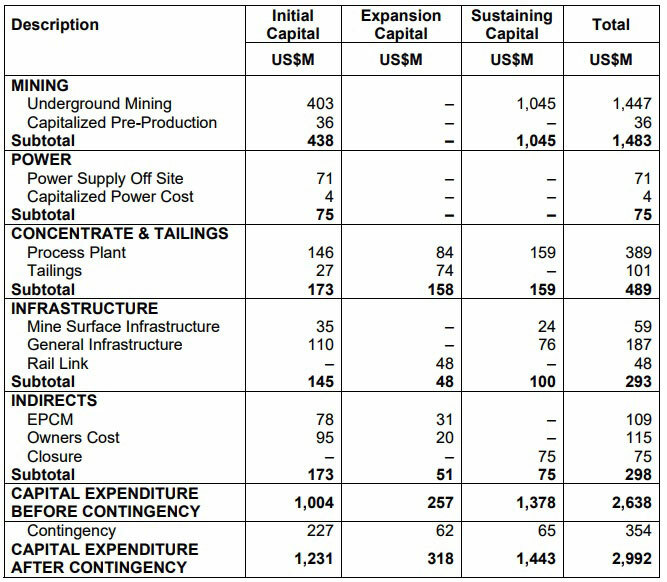 Kakula Mine estimated capital investment summary for six Mtpa production. Note: Recently approved, probable and possible projects with nominal copper production capacity in excess of 200 kt/a (based on public disclosure and information gathered in the process of routine research). The Kakula 2017 PEA has not been reviewed by Wood Mackenzie. Source: Wood Mackenzie. The after-tax NPV sensitivity to metal price variation is shown in Table 7 for copper prices from US$2.00/lb to US$4.00/lb. 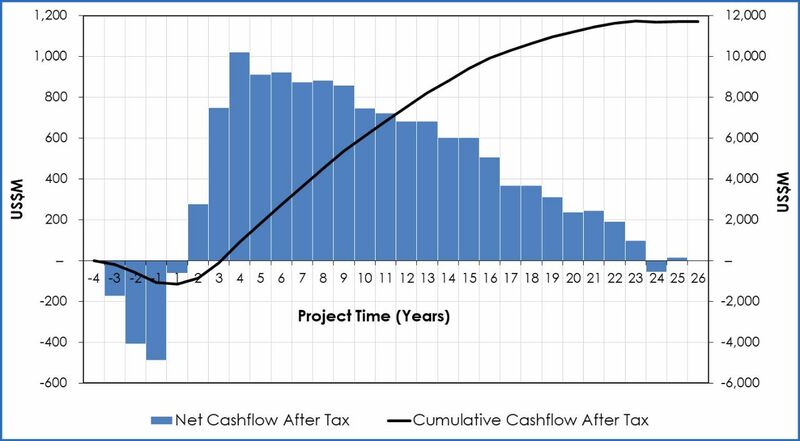 The annual and cumulative cash flows are shown in Figure 8. Figure 8. 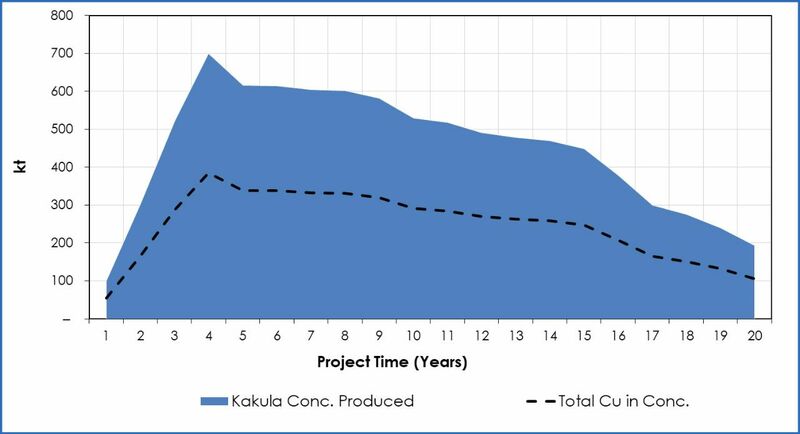 Kakula Mine projected cumulative cash flow. The Kakula 2017 PEA also assesses the potential development of the Kakula and Kamoa deposits as an integrated, 12 Mtpa mining and processing complex, built in two stages. This scenario envisages the construction and operation of two separate facilities: first, an initial mining operation would be established at the Kakula Mine on the Kakula Deposit; and then a subsequent, separate mining operation would begin at the Kansoko Mine on the Kansoko Sud and Kansoko Centrale areas of the Kamoa Deposit. As this two-staged development scenario is based on currently delineated resources, it does not incorporate the mining of any resources that may be delineated at the Kakula West discovery or that may result from the ongoing drilling of high-priority targets located in the untested parts of the Kamoa-Kakula Project area. Each mining operation is expected to be a separate underground mine with a shared processing facility and surface infrastructure. Included in this scenario is the construction of a direct-to-blister flash copper smelter with a capacity of 690,000 tonnes of copper concentrate per annum. As the resources at the Kakula and Kansoko Mines are mined out, production would begin at Kamoa North to maintain throughput of 12 Mtpa to the then existing concentrator and smelter complex. Very-high-grade initial phase projected to have a grade of 7.3% copper in year four and an average grade of 5.72% copper during the first 10 years of operations, resulting in estimated average annual copper production of 370,000 tonnes. Annual copper production is estimated at 542,000 tonnes in year nine, ranking Kamoa-Kakula as one of the five largest copper mines in the world. Initial capital cost, including contingency, is US$1.2 billion, with subsequent expansions from Kansoko and other mining areas, as well as the smelter, to be funded by cash flows from the Kakula Mine. Average total cash costs of US$1.02/lb of copper during the first 10 years, including sulphuric acid credits. After-tax NPV, at an 8% discount rate, of US$7.2 billion. After-tax IRR of 33% and a payback period of 4.7 years. Key results of this potential development scenario are summarized in tables 8, 9 & 10 and figures 9 & 10. Table 8. 12 Mtpa Kamoa-Kakula PEA results summary. Table 9. 12 Mtpa Kamoa-Kakula PEA unit operating costs. Table 10. 12 Mtpa Kamoa-Kakula PEA copper price sensitivity. Figure 9. 12 Mtpa scenario mill feed and grade profile. Figure 10. 12 Mtpa scenario concentrate and metal production. Figure 11. 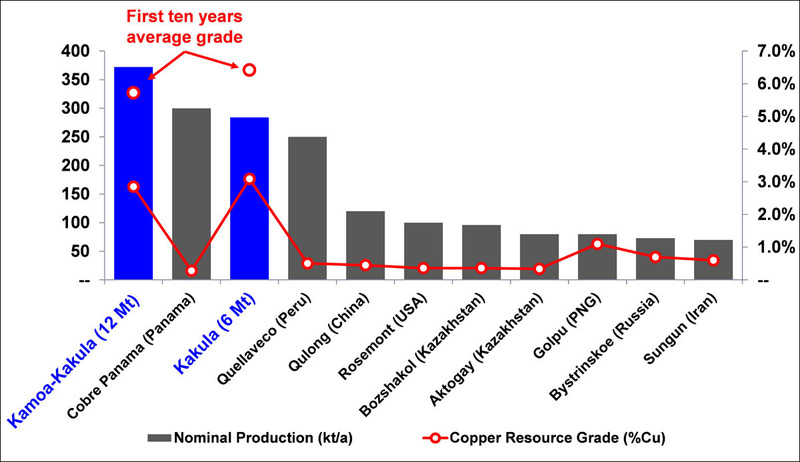 Projected 12 Mtpa Kamoa-Kakula production (year-nine peak copper production shown) compared to the world's projected top 20 producing mines in 2025 by paid copper production. 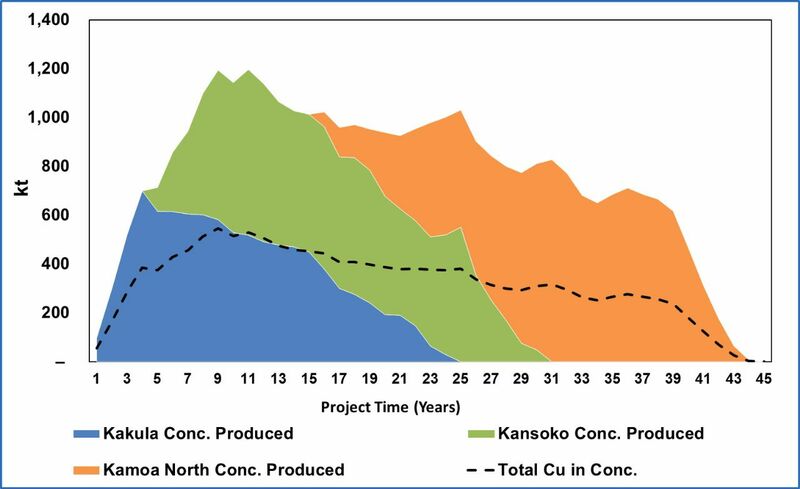 Note: Kamoa-Kakula production based on projected peak copper production (which occurs in year nine) of the 12 Mtpa development plan for the Kamoa-Kakula Project as detailed in the Kakula 2017 PEA. Source: Wood Mackenzie (based on public disclosure, the Kakula 2017 PEA has not been reviewed by Wood Mackenzie). 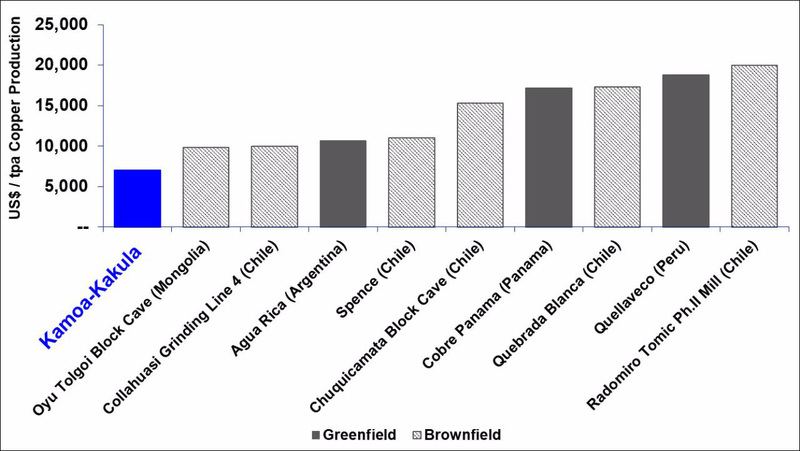 Note: Top 10 largest new greenfield copper projects defined as the 10 largest greenfield copper projects classified as "base case" or "probable" and ranked by nominal copper production (with Kamoa-Kakula's first ten years' average annual production of copper in concentrate considered to be its nominal copper production). Source: Wood Mackenzie, USGS (based on public disclosure, the Kakula 2017 PEA has not been reviewed by Wood Mackenzie). In addition to the PEA, a pre-feasibility study (PFS) has been completed for the development of a six Mtpa Kansoko Mine at the Kamoa Deposit. This refines the findings of the Kamoa March 2016 PFS, which envisaged a production rate of three Mtpa. The PFS is based entirely on the Kamoa 2017 PFS Mineral Reserve, details of which are shown in Table 13. The PFS re-assesses the development of the Kamoa Deposit as a stand-alone six Mtpa mining and processing complex. The life-of-mine production scenario schedules 125.2 million tonnes to be mined at an average grade of 3.81% copper, producing 11.4 million tonnes of high-grade copper concentrate, containing approximately 9.2 billion pounds of copper. The economic analysis uses a long-term price assumption of US$3.00/lb of copper and returns an after-tax NPV at an 8% discount rate of US$2.1 billion, an increase of 110% compared to the after-tax NPV8% of US$986 million that was projected in the Kamoa 2016 PFS. It has an after-tax IRR of 24.2% and a payback period of 5.0 years. The estimated initial capital cost, including contingency, is US$1.0 billion. Key results of the Kamoa 2017 PFS for a single six Mtpa mine are summarized in Table 11. Table 11. 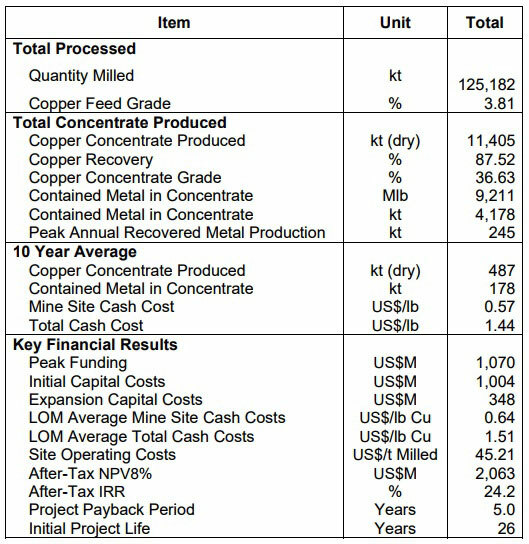 Kansoko Mine results summary for six Mtpa production. In August 2012, the DRC government granted mining licences to Ivanhoe Mines for the Kamoa-Kakula Project that cover a total of 397 square kilometres. The licences are valid for 30 years and can be renewed at 15-year intervals. Mine development work at the project began in July 2014 with construction of a box cut for the decline ramps for the Kansoko Mine. The Mineral Resource for the Kamoa-Kakula Copper Deposit has an effective date of November 27, 2017. The Kamoa and Kakula Mineral Resources are summarized in Table 12 and are reported on a 100% basis. Table 12. Consolidated Mineral Resource Statement, Kamoa-Kakula Project - November 27, 2017, 1% copper cut-off over minimum thickness of approximately 3 metres. Notes to accompany Kamoa-Kakula Project Mineral Resource table. Ivanhoe's Mineral Resources Manager, George Gilchrist, Professional Natural Scientist (Pr. Sci. Nat) with the South African Council for Natural Scientific Professions (SACNASP), estimated the Mineral Resources under the supervision of Dr. Harry Parker and Gordon Seibel, both RM of Society of Mining, Metallurgy and Exploration (SME), who are the Qualified Persons for the Mineral Resource estimate. The effective date of the estimate is November 27, 2017, and the cut-off date for the drill data is May 16, 2017. Mineral Resources are estimated using the 2014 CIM Definition Standards for Mineral Resources and Mineral Reserves. Mineral Resources at Kamoa are inclusive of Mineral Reserves. No Mineral Reserves are currently reported at Kakula. Mineral Resources are estimated assuming underground mining methods, a copper price of US$3.00/lb (Kamoa) and US$3.00/lb (Kakula), a cut-off of 1% total copper, an approximate minimum thickness of 3 metres, and that concentrates will be produced and sent to a smelter. A new, expanded mineral resource estimate for Kamoa-Kakula, based on drill holes completed to the end of December 2017, is expected to be issued in January 2018. The new estimate will include initial resources for the Kakula West Discovery and the saddle area between the existing Kakula Mineral Resource area and the Kakula West Discovery. The Kamoa 2017 PFS Mineral Reserve has been estimated by Qualified Person Jon Treen, Senior Vice President, Stantec Consulting LLC, using the 2014 CIM Definition Standards for Mineral Resources and Mineral Reserves to conform to the Canadian National Instrument 43-101 Standards of Disclosure for Mineral Projects. 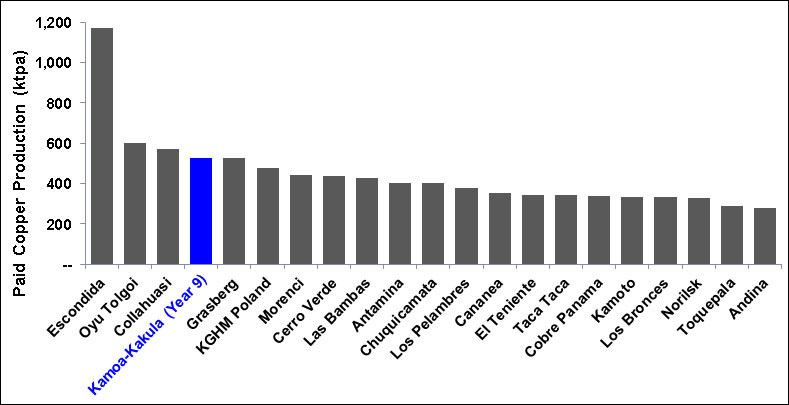 The total Mineral Reserve for the Kamoa Project is shown in Table 13. The Mineral Reserve is based on the May 2014 Mineral Resource. The Mineral Reserve is entirely a Probable Mineral Reserve that was converted from Indicated Mineral Resources. The effective date of the Mineral Reserve statement is November 28, 2017. Table 13. Kamoa 2017 PFS Mineral Reserve Statement. An elevated cut-off of US$100.00/t NSR was used to define the stoping blocks. A cut-off of US$80.00/t NSR was used to define ore and waste for the mine plan. The Kamoa 2017 PFS Mineral Reserve ranges between depths of 60 metres and 1,300 metres below surface and the average dip is approximately 17 degrees. Given the favourable mining characteristics of the Kamoa Mineral Resource, it is considered amenable to large-scale, mechanized, room-and-pillar mining or control convergence room-and-pillar (CCRP) mining. The arrangement of the declines at Kansoko Sud and the Mineral Reserve mining areas are shown in Figure 2. Mining methods in the Kakula 2017 PEA are assumed to be a combination of controlled-convergence room-and-pillar (CCRP) and drift-and-fill. For the Kakula Mine, drift-and-fill mining utilizing paste backfill was selected as the mining method for the thick high grade areas. This method was selected to maximize the extraction of the Mineral Resource where the selected mining height is greater than six metres and multiple mining lifts are required to achieve maximum extraction. The Mineral Resource that is between three metres and six metres will be mined using the CCRP mining method. At the planned Kansoko Mine, in the Kansoko Sud and Centrale areas the CCRP mining method was selected for ore zone depths of below 150 metres and mining heights of six metres or less. The design for the Kansoko Sud and Centrale mining areas is based on the Kamoa 2016 PFS mine design, which includes a service decline and a conveyor decline. The production rate envisaged in the Kamoa 2017 PFS is to six Mtpa compared to four Mtpa outlined in the 2016 Kamoa PFS. At Kakula, the deposit is planned to be similarly accessed by twin declines with a productive mining rate of six Mtpa. CCRP mining method is a form of room-and-pillar that includes a second phase of pillar reduction after the cut line has advanced. The in-panel pillars are designed in post destructive state allowing most of the pillars to be trimmed by mechanical means ensuring controlled excavation and monitoring of the convergence process. This method is productive and provides very good extraction rates at relatively low costs. The CCRP mining method has been successfully implemented by KGHM at its copper-mining operations in Poland for the past 20 years. Ivanhoe Mines engaged KGHM Cuprum R&D Centre Ltd. to study the applicability of this method to Kamoa. The results of the study indicate that the Kamoa Deposit is suited to the application of the CCRP mining method. Between 2010 and 2015, a series of metallurgical test work programs were completed on drill-core samples of known Kamoa copper mineralization. These investigations focused on metallurgical characterization and flow-sheet development for the processing of hypogene and supergene copper mineralization. In 2016, further bench-scale metallurgical flotation test work was carried out at XPS Consulting and Testwork Services laboratories in Falconbridge, Ontario, Canada. This test work was conducted on composite samples of drill core from the Kansoko Sud and Kansoko Centrale areas in the southern part of the Kamoa Mineral Resource area. The flowsheet developed was suited for the fined grained nature of the material and yielded positive results. Test work on a composite grading 3.61% copper produced a copper recovery of 85.4% at a concentrate grade of 37.0% copper. The second composite, grading 3.20% copper, produced a copper recovery of 89.2% at a concentrate grade of 35.0% copper using the same flowsheet. Additional bench-scale metallurgical flotation test work was carried out in 2016 on two chalcocite-rich composites from the Kakula Deposit at a Zijin Mining laboratory in Xiamen, China, and by XPS Consulting and Testwork Services. The initial composite, grading 4.1% copper, produced a copper recovery of 86% at a concentrate grade of 53% copper at the Zijin Mining laboratory in July 2016. The second composite, grading 8.1% copper, produced a recovery of 87% at an extremely high concentrate grade of 56% copper. The flotation tests were conducted using the circuit developed during the 2016 Kamoa pre-feasibility study. Average arsenic levels in the concentrate were measured to be approximately 0.02%, which is significantly lower than the limit of 0.5% imposed by Chinese smelters. Extremely low arsenic levels in concentrate are expected to attract a premium from copper-concentrate traders. The concentrator design incorporates a run-of-mine stockpile, followed by primary and secondary crushing on surface. The crushed material with a design-size distribution of 80% passing (or P80) nine millimetres (mm), is fed into a two-stage ball-milling circuit for further size reduction to a target grind size p80 of 53 micrometres (µm). The milled slurry will be passed through a rougher and scavenger flotation. The high-grade, or fast-floating rougher concentrate, and medium-grade, or slow-floating scavenger concentrate, will be collected separately. The rougher concentrate is upgraded in two stages to produce a high-grade concentrate. The medium-grade scavenger concentrate and tailings from the two rougher cleaning stages, representing approximately 25% of the feed mass, will be combined and re-ground to a P80 of 10µm before being cleaned in two stages. The cleaned scavenger concentrate then will be combined with the cleaned rougher concentrate to form the final concentrate. The final concentrate will be thickened before being pumped to the concentrate filter where the filter cake then will be bagged for shipment to market. Under the 12 Mtpa scenario examined in the Kakula 2017 PEA, the construction of a direct-to-blister flash (DBF) smelter is envisaged, subject to further study on feasibility, scale and timing. Flash smelting is typically advantageous compared to other technologies as the energy costs are relatively low. The smelter is designed with a capacity of 690,000 tonnes of concentrate, and would operate at full capacity fed by Kamoa-Kakula copper concentrates until the end of the mine life. Concentrate would be first dried and sent to the DBF where it is smelted in the reaction shaft with oxygen-enriched air to produce molten slag containing oxide minerals, blister copper and SO2-rich off-gas. The oxidation reactions provide sufficient heat required to melt the charge, although a small amount of external fuel is used for process control purposes. Molten slag and blister copper collect in the DBF furnace settler and are intermittently tapped via dedicated tapholes. The slag is reduced in two electric slag cleaning furnaces operating in series to recover copper in the form of blister and alloy, respectively. The SO2 rich off-gas is de-dusted, dried and sent to a double-contact-double-adsorption acid plant for production of high strength sulphuric acid which is sold to the local market. An on-site smelter offers numerous cost savings, including on treatment charges, certain royalties and transportation costs, particularly for the lower-grade copper concentrates from the Kansoko and Kamoa North mines. In addition, the sale of the sulphuric acid by-product would generate additional revenue. Sulphuric acid is in short supply in the DRC, and is imported for use in processing ore from oxide copper deposits. A phased logistics solution is proposed in the Kakula 2017 PEA. Initially, the corridor between southern DRC and Durban in South Africa is viewed as the most attractive and reliable export route. As soon as the railway between Kolwezi and Dilolo, a town near the DRC-Angolan border, is upgraded, the Kamoa-Kakula Project's production is expected to be transported by rail to the Atlantic port of Lobito in Angola. In addition, there is the potential to negotiate off-take arrangements with smelters in Zambia. MDM/Amec Foster Wheeler - Mineral Resource estimation, processing and infrastructure. Golder Associates - Environmental and hydrogeology. The independent Qualified Persons responsible for preparing the Kakula 2017 PEA and Kamoa 2017 PFS, on which the technical report will be based, are Bernard Peters (OreWin); Dr. Harry Parker (Amec Foster Wheeler); Gordon Seibel (Amec Foster Wheeler); Dean David (MDM/Amec Foster Wheeler); William Joughin (SRK); and Jon Treen (Stantec). Each Qualified Person has reviewed and approved the information in this news release relevant to the portion of the Kakula 2017 PEA and Kamoa 2017 PFS for which they are responsible. Wood Mackenzie provided data based on public disclosure of comparable copper projects for the compilation of certain figures used in this release; however, Wood Mackenzie did not review the Kakula 2017 PEA. Amec Foster Wheeler reviewed the sample chain of custody, quality assurance and control procedures, and qualifications of analytical laboratories. Amec Foster Wheeler is of the opinion that the procedures and QA/QC control are acceptable to support Mineral Resource estimation. Amec Foster Wheeler also audited the assay database, core logging and geological interpretations on a number of occasions between 2009 and 2015 and has found no material issues with the data as a result of these audits. Ivanhoe Mines maintains a comprehensive chain of custody and QA/QC program on assays from its Kamoa‑Kakula Copper Project. Half-sawn core is processed at its on-site preparation laboratory in Kamoa, prepared samples then are shipped by secure courier to Bureau Veritas Minerals (BVM) Laboratories in Australia, an ISO17025 accredited facility. Copper assays are determined at BVM by mixed-acid digestion with ICP finish. Industry-standard certified reference materials and blanks are inserted into the sample stream prior to dispatch to BVM. For detailed information about assay methods and data verification measures used to support the scientific and technical information, please refer to the Kakula 2017 Resource Update, June 2017 technical report available on the SEDAR profile of Ivanhoe Mines at www.sedar.com or under technical reports on the Ivanhoe Mines website at www.ivanhoemines.com. Ivanhoe Mines is advancing its three principal projects in Southern Africa: Mine development at the Platreef platinum-palladium-gold-nickel-copper discovery on the Northern Limb of South Africa's Bushveld Complex; mine development and exploration at the Tier One Kamoa-Kakula copper discoveries on the Central African Copperbelt in the DRC; and upgrading at the historic, high-grade Kipushi zinc-copper-lead-germanium mine, also on the DRC's Copperbelt. For details, visit www.ivanhoemines.com. Certain statements in this release constitute "forward-looking statements" or "forward-looking information" within the meaning of applicable securities laws, including without limitation: (i) the results of the preliminary economic assessment and the pre-feasibility study, including the future development of the Kamoa-Kakula Project as a six Mtpa underground Kakula Mine, integrated 12 Mtpa, two-stage development and a six Mtpa Kansoko Mine; (ii) the use of the controlled convergence room-and-pillar mining method; (iii) the expectation that concentrate with extremely low arsenic levels will attract a premium from traders; (iv) the expectation that the Kamoa-Kakula Copper Project's production is to be transported by rail to the port of Lobito once the the railroad between Kolwezi and Dilolo is rehabilitated; (v) the timing, results and completion of future studies; (vi) the expectation that the advance payment to SNEL will be recovered through a reduction in the power tariff; (vii) the expectation that the refurbished Koni and Mwadingusha hydroelectric plants will provide power to the Kamoa-Kakula Copper Project; and (viii) the expectation that an updated Mineral Resource estimate for the Kakula deposit will be completed in January 2018. Such statements involve known and unknown risks, uncertainties and other factors which may cause the actual results, performance or achievements of Ivanhoe Mines, or industry results, to be materially different from any future results, performance or achievements expressed or implied by such forward-looking statements or information. Such statements can be identified by the use of words such as "may", "would", "could", "will", "intend", "expect", "believe", "plan", "anticipate", "estimate", "scheduled", "forecast", "predict" and other similar terminology, or state that certain actions, events or results "may", "could", "would", "might" or "will" be taken, occur or be achieved. These statements reflect the Ivanhoe Mine's current expectations regarding future events, performance and results and speak only as of the date of this news release. As well, all of the results of the Kakula 2017 PEA and the Kamoa 2017 PFS constitute forward-looking information or statements, including estimates of internal rates of return (including an after-tax internal rate of return of 36.2% with a payback period of 3.1 years for the initial six Mtpa Kakula Mine option), net present value (including a project NPV of US$7.2 billion at an 8% discount rate in a two mine Kamoa and Kakula integrated development scenario and US$4.2 billion at an 8% discount rate for the initial six Mtpa Kakula Mine option), future production (including an average annual production rate of 284,000 tonnes of copper during the first 10 years of operations and production of 385,000 tonnes in year four for the initial six Mtpa Kakula Mine option), estimates of cash cost (including average total cash cost of US$1.14/lb during the first 10 years of operations for the initial six Mtpa Kakula Mine option), assumed long term price for copper of US$3.00 per pound, proposed mining plans and methods (including the potential to use the controlled convergence room-and-pillar mining method), mine life estimates, cash flow forecasts, metal recoveries, production of copper concentrate in excess of 50% copper with extremely low arsenic levels, and estimates of capital and operating costs (including initial capital costs of US$1.2 billion in either option considered in the Kakula 2017 PEA). Furthermore, with respect to this specific forward-looking information concerning the development of the Kamoa-Kakula Copper Project, Ivanhoe Mines has based its assumptions and analysis on certain factors that are inherently uncertain. Uncertainties include among others: (i) the adequacy of infrastructure (including the rehabilitation of the Koni, Mwadingusha and Nzilo 1 hydroelectric power plants and accessibility and viability of rail links); (ii) unforeseen changes in geological characteristics; (iii) changes in the metallurgical characteristics of the mineralization; (iv) the ability to develop adequate processing capacity; (v) the price of copper; (vi) the availability of equipment and facilities necessary to complete development; (vii) the size of future processing plants and future mining rates; (viii) the cost of consumables and mining and processing equipment; (ix) unforeseen technological and engineering problems; (x) accidents or acts of sabotage or terrorism; (xi) currency fluctuations; (xii) changes in laws or regulations; (xiii) the availability and productivity of skilled labour; (xiv) the regulation of the mining industry by various governmental agencies; (xv) political factors, including political stability; and (xvi) the completion of the railway upgrade between Kolwezi and Dilolo. This release also contains references to estimates of Mineral Resources and Mineral Reserves. The estimation of Mineral Resources is inherently uncertain and involves subjective judgments about many relevant factors. Mineral Resources that are not Mineral Reserves do not have demonstrated economic viability. The accuracy of any such estimates is a function of the quantity and quality of available data, and of the assumptions made and judgments used in engineering and geological interpretation (including estimated future production from the Kamoa-Kakula Copper Project, the anticipated tonnages and grades that will be mined and the estimated level of recovery that will be realized), which may prove to be unreliable and depend, to a certain extent, upon the analysis of drilling results and statistical inferences that may ultimately prove to be inaccurate. Mineral Resource or Mineral Reserve estimates may have to be re-estimated based on: (i) fluctuations in copper price; (ii) results of drilling, (iii) metallurgical testing and other studies; (iv) proposed mining operations, including dilution; (v) the evaluation of mine plans subsequent to the date of any estimates; and (vi) the possible failure to receive required permits, approvals and licenses or changes to existing mining licences. Ivanhoe Mines' actual results could differ materially from those anticipated in these forward-looking statements as a result of the factors set forth in the "Risk Factors" section and elsewhere in the Ivanhoe Mines' most recent Management's Discussion and Analysis report and Annual Information Form, available at www.sedar.com.